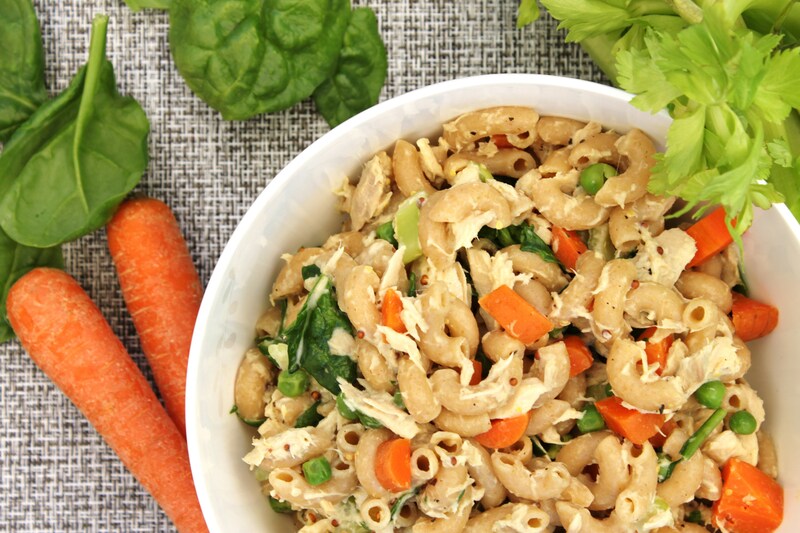 This pasta salad is an oldie but a goodie 🙂 You can really throw in anything that you fancy, but here is my version for today. It will change depending on what veggies I have in the fridge to use up. It may not work for your kids (if it does AWESOME!) but it’s a great one to have ready in your fridge for a quick one bowl lunch for Mama or to take to work. Of course you can always adjust it to suit your little ones palette also. I added some nutritional yeast for an extra boost of vitamin b12 (you can find it in most health food sections of your grocery store). Cook the pasta as directed on the box (add the chopped carrot into the boiling water with the pasta). A couple minutes before the pasta/carrots are cooked throw in the frozen peas until end of cook time. Drain the pasta, carrots and peas and set aside. Add the tuna, celery and spinach to a large bowl. In a separate small bowl stir to combine the mayo, dijon mustard, grainy mustard and nutritional yeast. Add the dressing to the pasta mixture in your large bowl stirring to combine. Add fine grain sea salt and pepper to taste. Serve warm, or keep in the fridge for a few days for quick lunches or as a side at dinner!